Oi, Siri? You there: Cortana! Why can't you run on my Pi? Amazon.com has released a Raspberry Pi version of its Alexa Voice Assistant, the company's voice-activated “companion” bot that resides in its Echo range of speakers and offers voice-driven home automation and shopping. Amazon's cylindrical Echo speakers make a virtue of simplicity: one just plugs them into power and Wi-Fi, then speaks the word “Alexa” to activate their search powers. Amazon promises its plan will make the Pi do the same, even if the results (depicted above or here for readers on other devices) make for a rather different domestic aesthetic. Alexa is already open-ish, as Amazon makes tools available that allow users to bake the service into their own products. 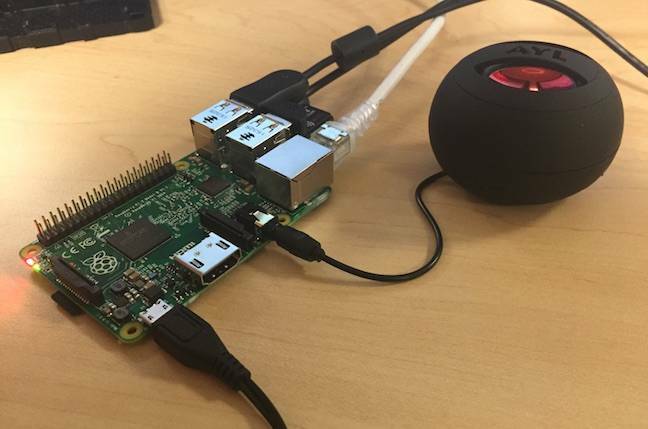 This new effort, available on GitHub, takes things a step further by not only offering the code needed to access the service but also walks users through the process required to turn a Raspberry Pi into a home assistant. Amazon's not being entirely altruistic here: not only does it suggest itself as a fine source for the microphone and speaker needed to get Alexa working, it stands to profit from Alexa's deep ties to its retail offerings. Then there's the small matter of gaining more Alexa users whose input will be Amazon's for the analysing and monetising. In return, those who choose to turn their Pis into hosts for Alexa get an interesting (and for many people educational) project that's explained in an impressively detailed procedure. And a voice assistant to compare with Apple's Siri, Microsoft's Cortana and Google's as-yet-free-of-anthropomorphism efforts in the field.